South end of Kerio Valley, Elgeyo-Marakwet, Kenya. Dec. 2014. 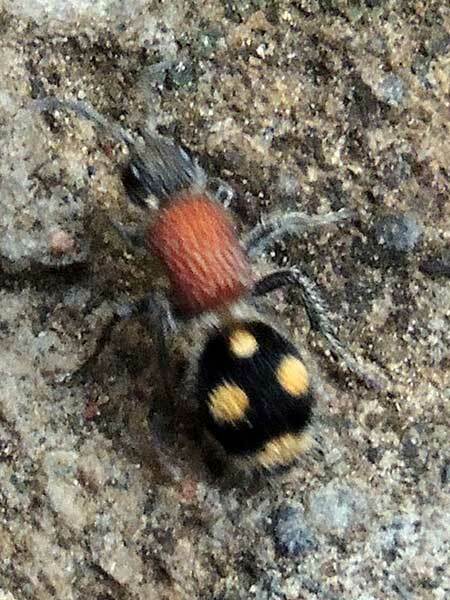 Velvet Ants are an easily recognizable family of wasps and are not true ants. Female velvet ants are often seen running rapidly over the soil surface and frequently entering cracks and tunnels into the soil. Their purpose is to locate an underground nest of a solitary bee or other insects depending on the species of velvet ant. The bright markings are related to the fact that female Mutillidae are equipped with a powerful sting. It is a warning pattern. Males on the other hand are harmless and so their colorful marking are a ruse - they are mimics of more dangerous hymenoptera. Male and female mutillids are rarely found together and are very dissimilar and as a result matching males and females by species is difficult. Males are found at flowers taking nectar or pollen.